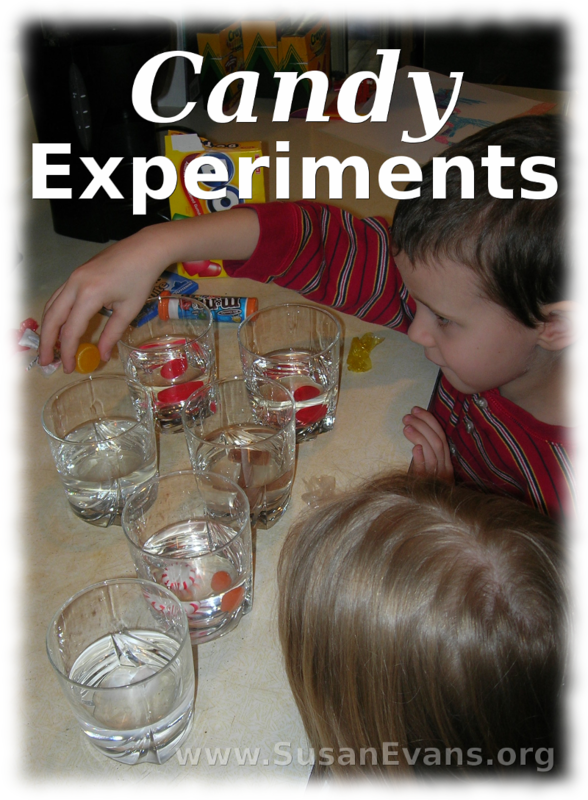 Whenever there is too much candy in the house is a great opportunity to do candy experiments. One experiment is the acid test. 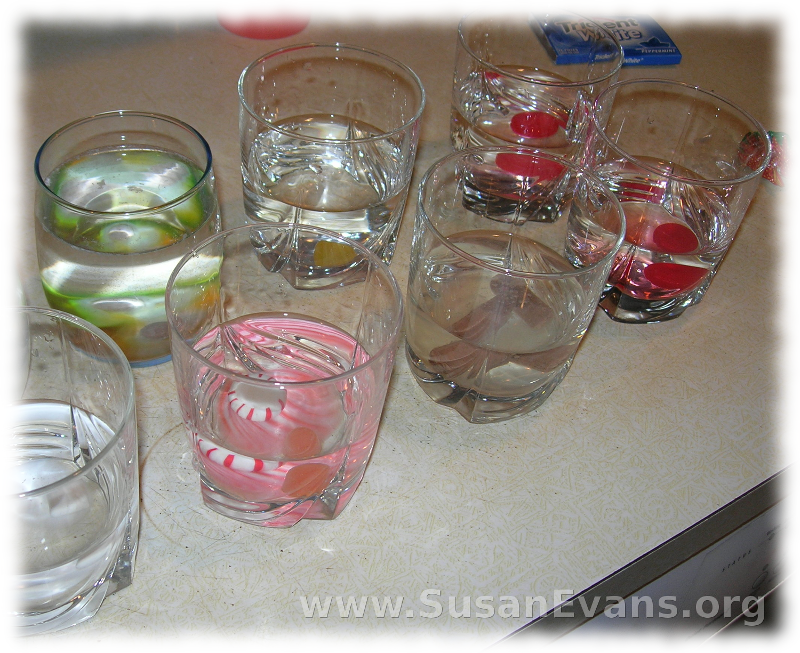 Pour water into several glasses, and plunk in a candy into each one. If the candy is sour, it will be more fun. Dump a spoon of baking soda into the water. If bubbles appear, the candy is acidic. My daughter was watching as M&M’s dissolved in a shallow pan of water. She stuck a paper towel into it and saw the color creep up the paper towel. 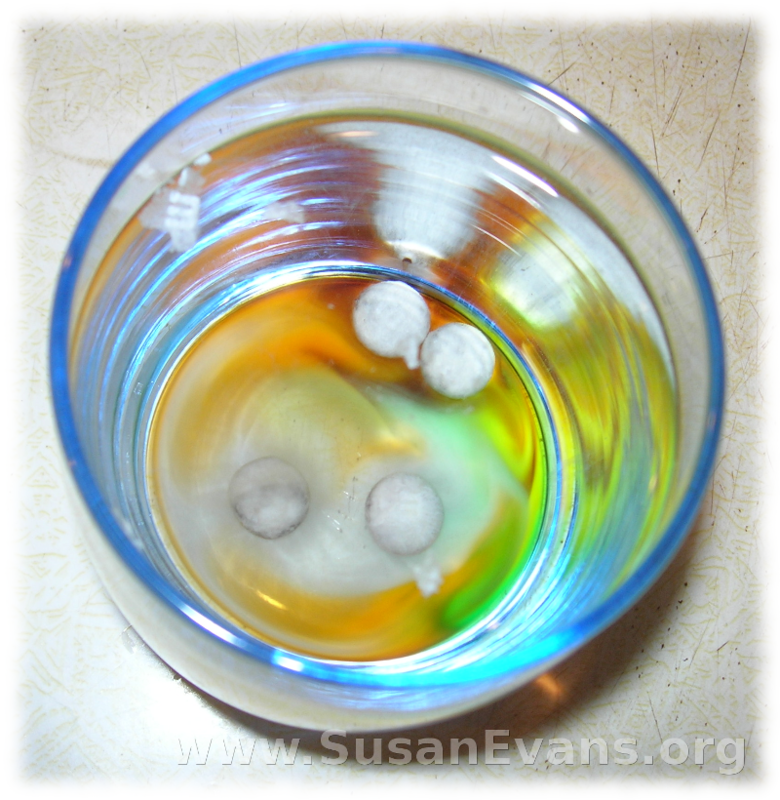 You can do a sinking and floating experiment, to see which candies are denser than water. None of our candy floated, since it was hard candy. Lighter candy like 3 Musketeers would float, but who wants to ruin chocolate? Chocolate is never a left-over candy at our house. The most fun activity we did during these candy experiments was to throw M&M’s into some water to dissolve. (I know, I’m wasting perfectly good chocolate, but this experiment is worth it.) The M’s began floating on the top of the water, disconnected from the M&M’s. (The wax from the M’s was less dense than water.) It was almost like a magic trick. This entry was posted on Wednesday, December 29th, 2010 at 9:03 am	and is filed under Science. You can follow any responses to this entry through the RSS 2.0 feed. You can skip to the end and leave a response. Pinging is currently not allowed. I love this experiment! I am going to do it with the kids…can’t wait! Thank you for stopping by my blog and leaving a comment. I’ve hopped over to your Hands-On-Learning site and LOVE IT! I even added it to one of my sites pages. 🙂 Blessings! 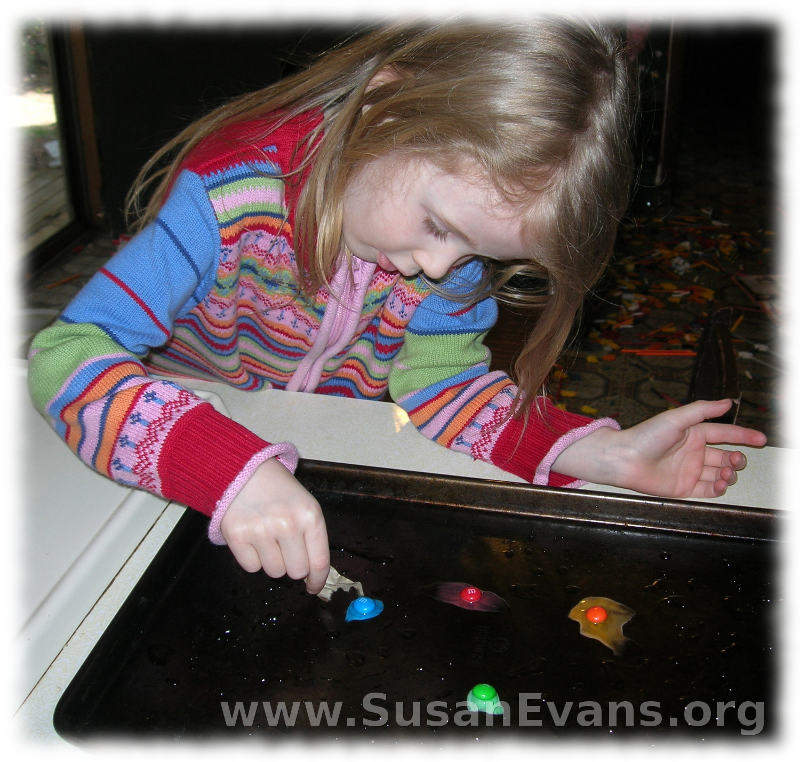 We’ve been doing experiments on m&m’s lately too … my son loves them! We were especially surprised then the “m” floated off the candy. We’ll have to try some of the other experiments you listed. How fun! as well. I’ll have to try it. BTW thanks for stopping by my blog. So glad you enjoyed the experiments! I’m trying to think what other kinds of candy float–you might want to try marshmallows, or Peeps, or anything filled with marshmallow. Love these! That m&m trick is one of my favorites.